Hello, everyone! This week I wanted to share the How To’s that I’ve seen floating around the web that are now on my list to try one day. Enjoy! I always get a little skittish when I see paper near an open flame, but these little lanterns were so cute I’ll deal with it. I’ve been eating soup like a madwoman this past month. So simple to make, and you can make tons more than you need and eat off of the leftovers forever. A and I have been in love with the sweetness of cooked carrots, and you know I’m on board with anything that included curry. Seen any great tutorials lately? Want to plug one you’ve done? Leave a link in the comments so we can check it out! 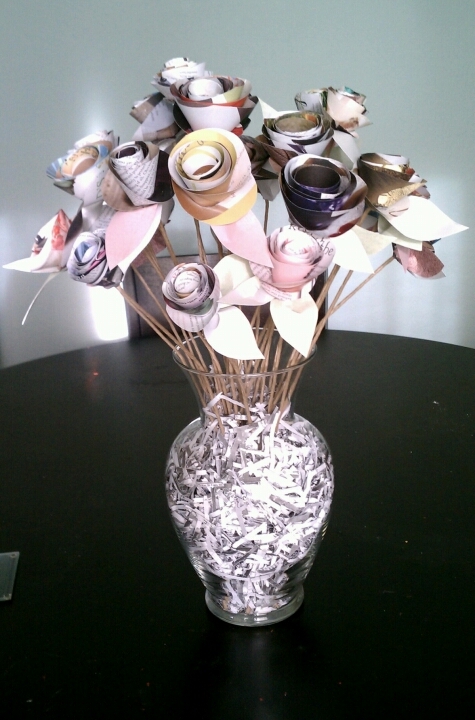 At first I thought about making a black and white bouquet out of sheet music, and looked into downloading our wedding song to print and use. But that would cost some dollahs, so next I thought of using vintage books, which I have plenty of. While going through my shelves I came across an old edition of Boho Magazine. Boho is printed on a heavy-gauge recycled paper, and the color scheme for this edition was beautiful grey-scale, yet saturated, colors. Perfect! And free!!! 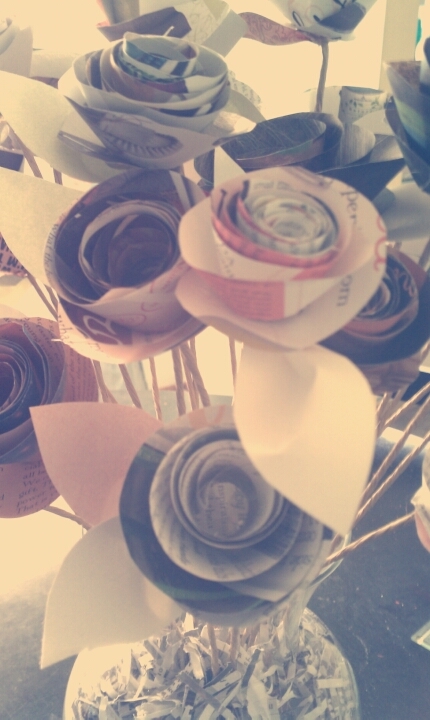 The flowers didn’t take long to make and glue. I’d say about two hours, or thee episodes of Grey’s Anatomy. I didn’t have the finger-cramping trouble that Cara did; I think it’s because I used my table to push against while rolling the flowers instead of holding them between my hands. I also got up frequently to check on dinner, so my fingers got a break. 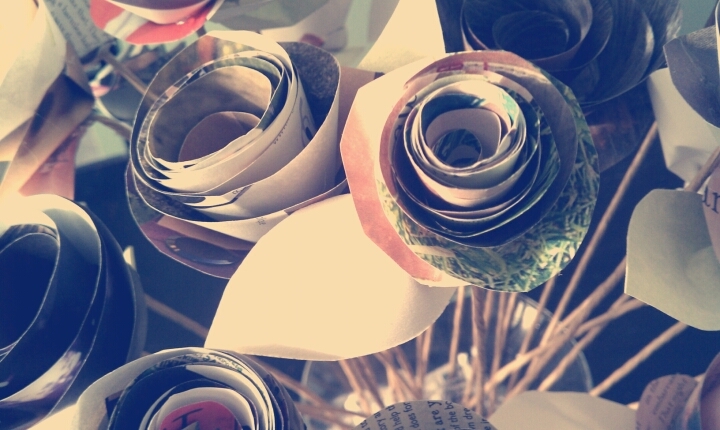 The next day it took about another two hours to get all the flowers glued to their stems, leaves attached, and arranged just so. I wanted a taller centerpiece than the vases I had could support, so I picked this one up at the thrift for 99¢. The best part was they had an identical one next to it, scratched up, for $5.99. Win! 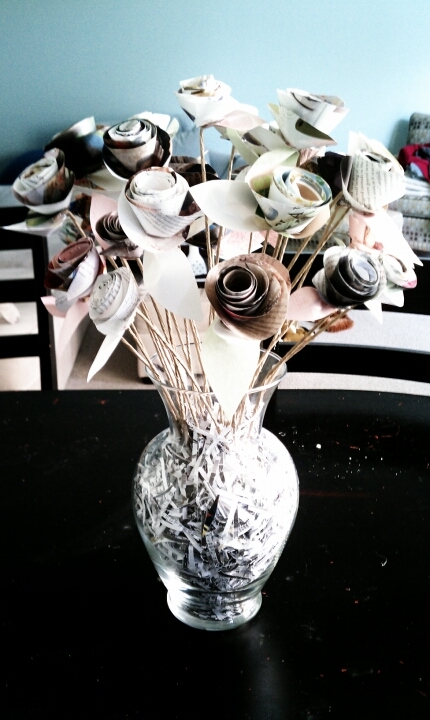 I splurged a little and bought thick gauge paper-wrapped florist’s wire. It’s almost twice as much as regular skinny plain wire, but (in my humble opinion) sooooo worth it. I think it takes my bouquet from crafty to Anthropologie. The filler is five shredded pages from an old edition of Found Magazine. I wanted a black & white base to compliment, but not take away from, the pops color going on above. Upcycling going on all around, you gotta love it. I cut my flowers in a more-or-less straight spiral instead of wavy; I wanted a cleaner look since my paper was full of print. The leaves are scrapbook paper I bought – most of them are an iridescent white, with lightly textured soft pink or green leaves to bring out Boho’s main color scheme. I did at least one leaf on each flower, predominantly using white, but put two on some that could take the extra visual heft. Each flower is totally unique with a different inside and outside, and I love each and every one. But my favorites are the ones that only had black on white text, with pops of highlighted words in color. Four hours, one hot glue gun burn, 30 paper blossoms, and $14.23 later I have a centerpiece that I’m even more obsessed with than I was when I saw the tutorial. Everything except the stems and the leaves are upcycled or secondhand – which I totally love – and it’s a showstopper, if I say so myself. 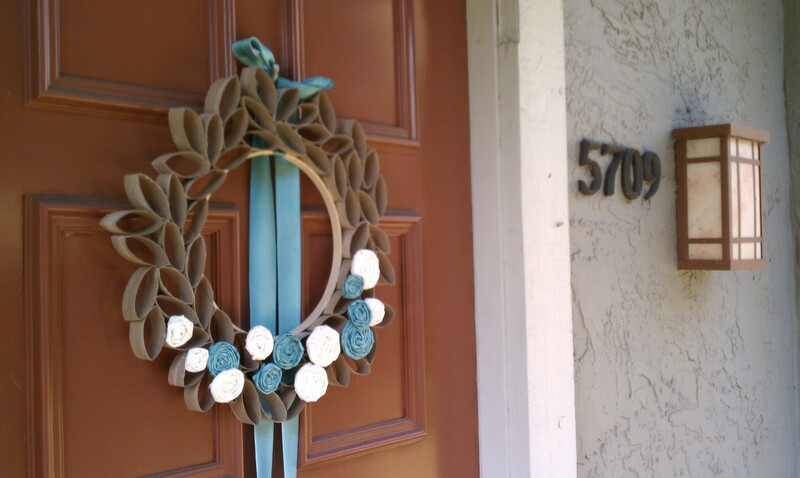 You can see it as soon as you come in my front door, and everyone who has come over has commented on it. 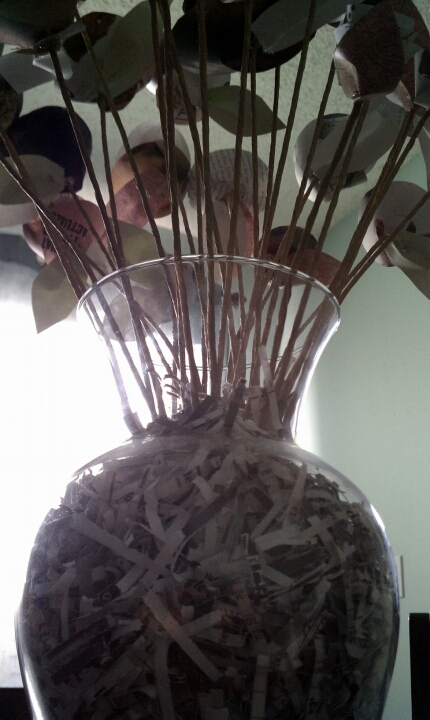 I can totally see these in smaller box vases, clustered tightly, as a centerpiece for a wedding or other chic DIY event. 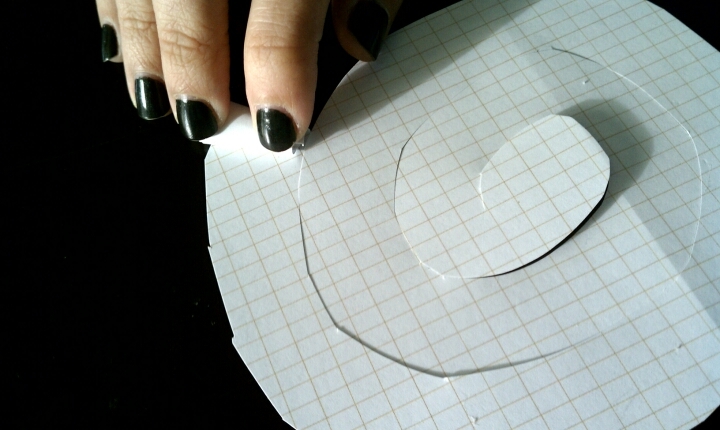 A huge thanks to Cara for sharing this tutorial! 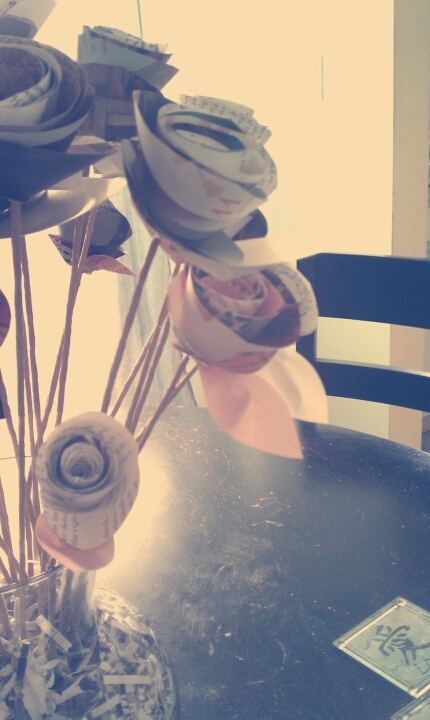 This definitely will not be the last time I play with paper flowers. What would be your dream color scheme for a flower boquet? Plain or printed? Multi-colored or mono? It’s just starting to get cold here in California. I’m not knitting much these days, but still cast on when I’m craving the feeling of creating. 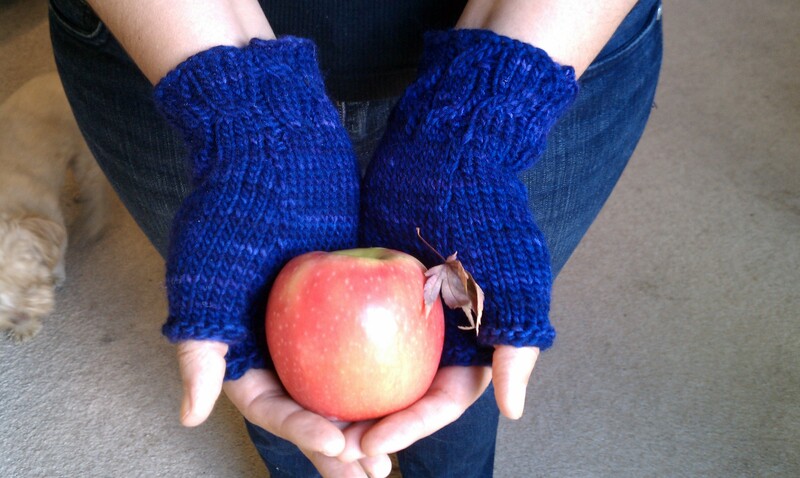 Plus I wanted a simple pair of fingerless gloves to ward off the chill. Widdershins means to circle in a course opposite the sun. I am craving the sun right now,in this time that is opposite the sun, and the offset cables on the cuffs look like they’re circling each other, chasing each other in a sort of twisty dance. This pattern is a great introduction to cables and thumb gussets, and is suitable for an adventurous beginner who has experience working in the round. I hope these bring some joy into your winter! Sized to fit a women’s hand. Use thicker yarn/bigger needles if you want a larger pair. Set of US size 5 double-pointed needles. (Note: every knitter is different. Use a needle size that gets you the gauge listed below. C4F – cable four front: slip two stitches onto cable needle and hold in front of your work. Knit two stitches off of left needle. 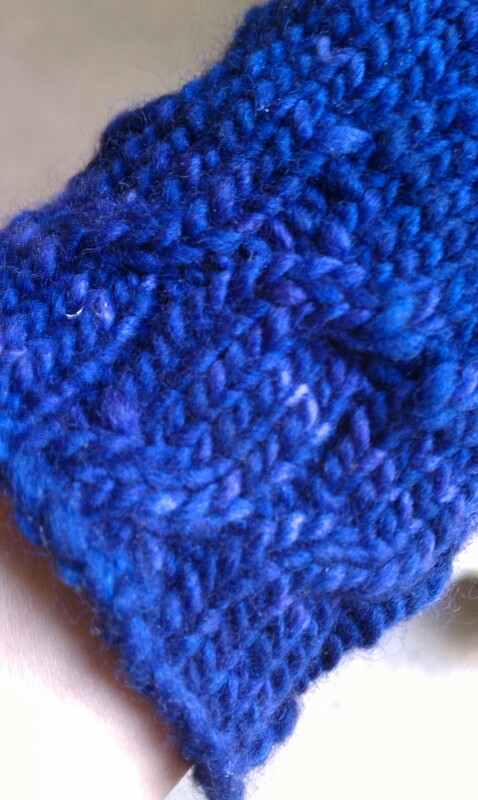 Knit two stitches off of cable needle. C4B – cable four back: slip two stitches onto cable needle and hold in back of your work. Knit two stitches off of left needle. Knit two stitches off of cable needle. Click here to see a very good video on how to do a cable. It’s so easy! Every time I taught a cable class people would look at me and say “that’s it?” That’s really it. Cast on 40 sts. Join in the round being careful not to twist. Place your stitch marker to indicate beginning of round. [Purl 1, Knit 4] to end (repeated a total of eight times.) This establishes the 4×1 rib. Knit, continuing in rib pattern for 4 rounds. A total of 5 rounds have been worked. [Purl 1, C4F, purl 1, knit 4] four times. Knit in 4×1 rib for 4 rounds. [Purl 1, Knit 4, purl 1, C4F] four times. Knit until you get to 4 sts before end of round marker. Place a new marker, knit 4. This establishes where you will increase for the thumb gusset. It should be centered over the last cable column of the round. Knit three rows, work increase round. Work even until work measures 4 ¾ inches from edge of cuff, or until work hits the junction of your thumb and hand with the cuff on your wrist. Thread tapestry needle with waste yarn and slide oll of the hand stitches onto yarn. (36 sts.) Remove markers and divide 14 thumb sts onto three needles. Join for working in the round. Knit three rows, purl one row. Slide sts off of waste yarn and back onto needles. Join for working in the round. Knit 7 rows, or until glove reaches desired length for covering hand. Purl one row. Bind off all stitches and weave in ends. Follow all directions for right hand, substituting a C4B for every C4F. If you make a pair, I’d love to see how they come out! Leave me a link in the comments and I’ll check them out. 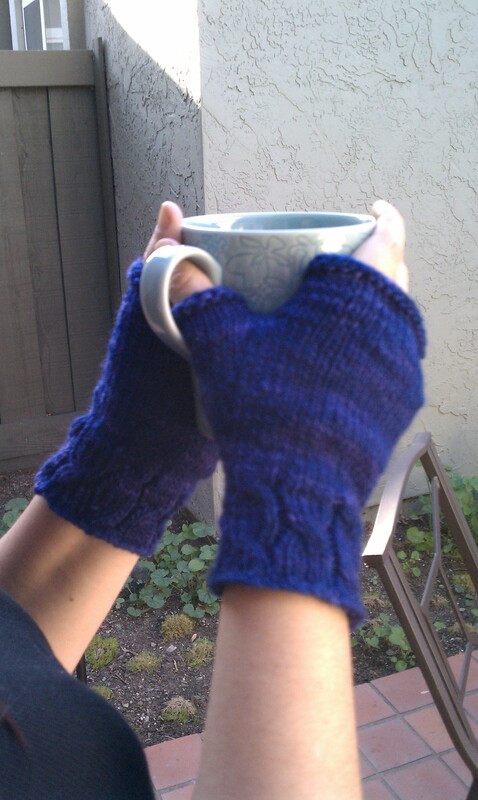 Check out Widdershins on Ravelry and see what people are doing with the pattern! Otherwise known as my attempt to keep the Starbucks Christmas spirit alive all year-long. Our home group is famous for forgoing the studying before any type of a break and having a good, old-fashioned pig-out session instead. The week before we parted ways for the holidays was no exception, and we said hello to Christmas by bringing our favorite holiday confections. Caleb and Elaine made their killer eggnog, Adelle pimped some of G’s now infamous bread, and I tried my hand at making cake pops. But not just any cake pops, my friends. For my first cake pop adventure I had my heart set on recreating those minty, chocolately balls of deliciousness that has made me mosey into my local Starbucks for more than my usual morning cuppa. 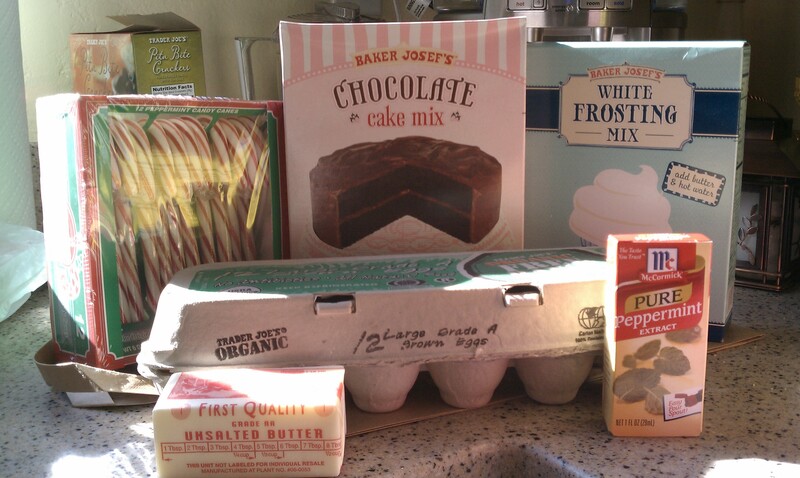 I’m sure Starbucks has a super secret recipe that mine is nowhere near (I use a store-bought cake mix because I’m lazy. ‘Nuff said.) 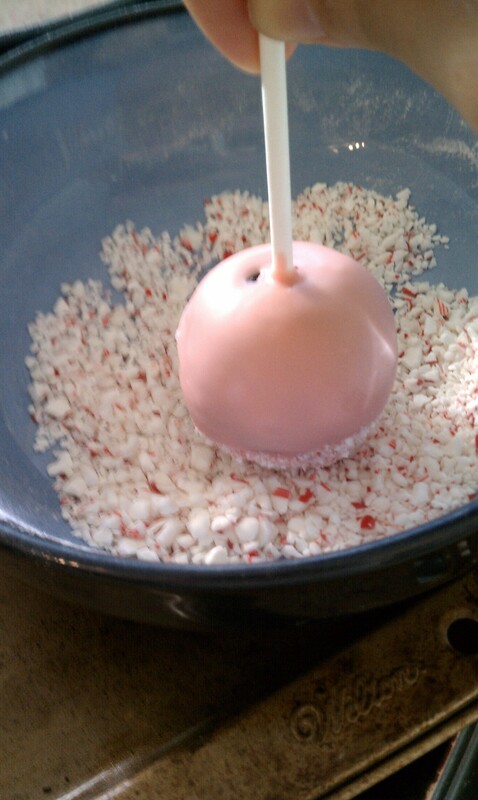 but for my first attempt at cake pops ever, I think they came out great! And since Starbucks isn’t carrying them anymore (at least not around these parts*) I thought I’d share my approximation of the recipe for any fellow Peppermint Brownie Cake Pop junkies that are going through withdrawal out there.